Last night was the final clash of the 2017 League of Legends World Championships, a climactic rematch between Samsung Galaxy and SKT T1. Before the games started, Riot Games put on a massive opening ceremony including a giant trophy, a live performance of Worlds theme “Legends Never Die,” and a freaking dragon. 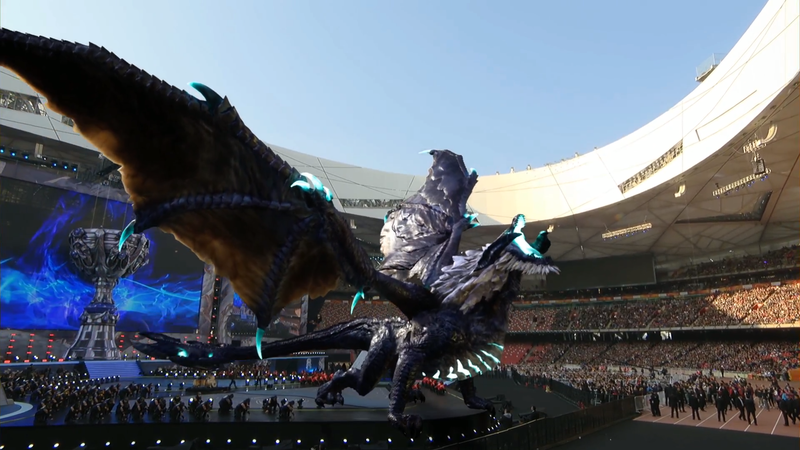 During the ceremony, an augmented reality dragon flew in, soared around the arena, and let out a good roar before taking off again. It’s modeled after the in-game Elder Drake, and it was pretty awesome. I will say this, though: After attending Dota 2's International this year, an event that also uses AR during the draft phase, it can get a little awkward for the fans in attendance because, well, they can’t see it. Which means you’re looking at one of the stream feeds on the giant screens instead of the live performers and spectacle that’s happening in the corporeal world. The dragon departed and the games kicked off. The finals were a huge deal for SKT T1 and mid lane player Lee “Faker” Sang-hyeok, one of the greatest names in the game. They were playing for a fourth Worlds title against Samsung Galaxy, their former opponents from the 2016 championship. SKT won 3-2 in 2016, but 2017 wouldn’t be such a close match. Most of the games were decided in the bottom lane match-up, where marksmen players (also called AD carries) and supports duke it out. While Samsung’s Park “Ruler” Jae-hyuk and Jo “CoreJJ” Yong-in had stellar showings, SKT’s Bae “Bang” Jun-sik wasn’t holding it together. In game two, you can see the threads start to unravel after Samsung Galaxy had taken the first match. A flash-forward into the enemy team left Bang without an escape, ready to be torn down by Galaxy. Two games brought SKT to the brink of a sweep, and in game 3, despite a slight gold and kill advantage, one critical fight brought down the legends. In a post-game handshake between the teams, cameras caught a tough moment of emotion for Faker, who just saw a fourth title slip through his fingers.